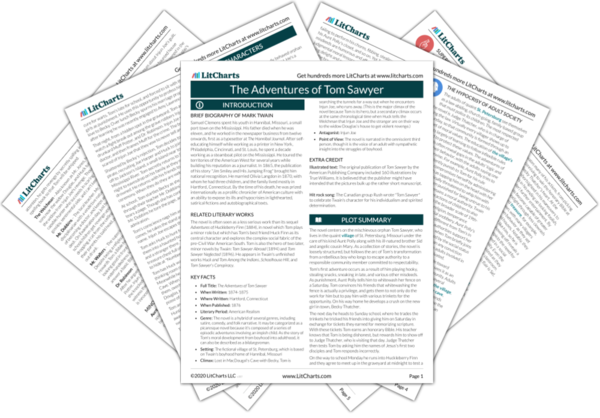 Instant downloads of all 946 LitChart PDFs (including The Adventures of Tom Sawyer). 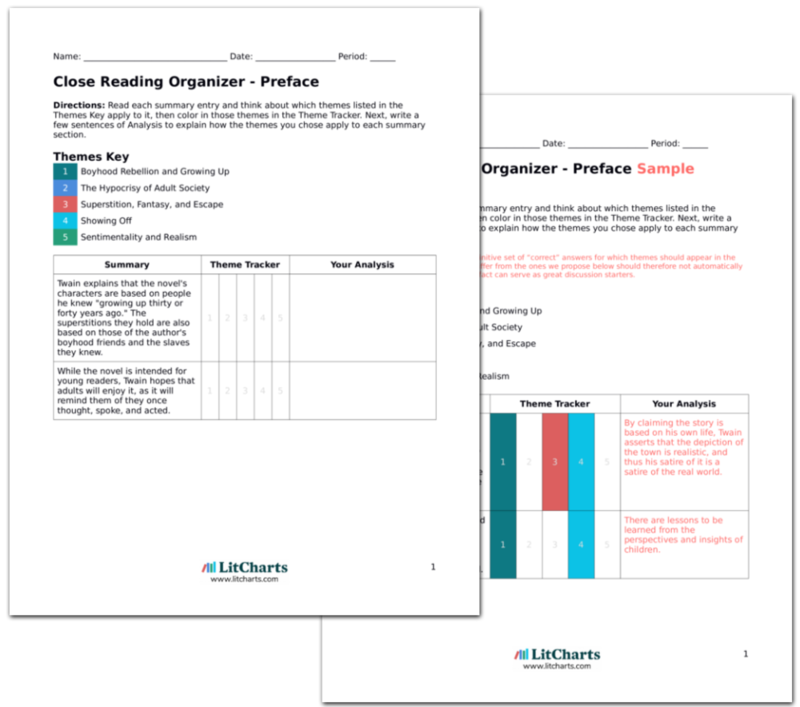 LitCharts assigns a color and icon to each theme in The Adventures of Tom Sawyer, which you can use to track the themes throughout the work. Now that Tom has returned, Aunt Polly continues to dote on him the following Monday at breakfast. Though she doesn't punish him as she usually would for his normal misbehavior, she does wonder aloud why he couldn't have sent her some sign he was okay, like Sid would have. Aunt Polly chides Tom for not having paid her special attention, overlooking his greater sin of having allowed everyone to believe he was dead. While Aunt Polly's coddling betrays her moral weakness, it also highlights the love she feels for Tom. Uncomfortable at Aunt Polly's nagging, Tom says he dreamt of her while away. He then recalls his "dream," describing exactly what he witnessed when he eavesdropped at Aunt Polly's Wednesday night. Tom then embellishes his story, saying that in the dream he left a piece of sycamore bark at Aunt Polly's bedside, which read: "We ain't dead—we are only off being pirates." Sid is scolded when he questions Tom's uncannily accurate account. Tom tells another lie to get more attention. Aunt Polly, unlike Sid, is willing to believe him. In doing so, she indulges in a supernatural belief—that Tom might have a sixth sense. While Tom and Aunt Polly behave wrongly in telling lies and believing in supernatural powers, their relationship is loving, which attests to their good character. Sid is truthful but ungenerous, and therefore dislikable. Tom enjoys the admiration of all the villagers. Thinking themselves "distinguished," he and Joe smoke in front of other children. Tom decides he doesn't need Becky. Instead, "He would live for glory." Tom's selfish behavior in allowing the village to believe him dead has been unduly rewarded, and he grows more full of himself. He expresses his self-importance by aping the behavior of "distinguished," or respected, adults, specifically men who smoke to display their affluence. If Tom's actions are pompous, so are theirs. At school, seeing Tom again for the first time since his disappearance, Becky shows off to get Tom's attention. He displays no interest, talking to Amy Lawrence instead. Becky announces she will host a picnic. Everyone begs for an invitation, except Tom and Amy. Becky runs off to cry. Becky's efforts to catch Tom's eye mirror Tom's earlier attempts to catch hers. He reacts coldly, as she previously did to him. 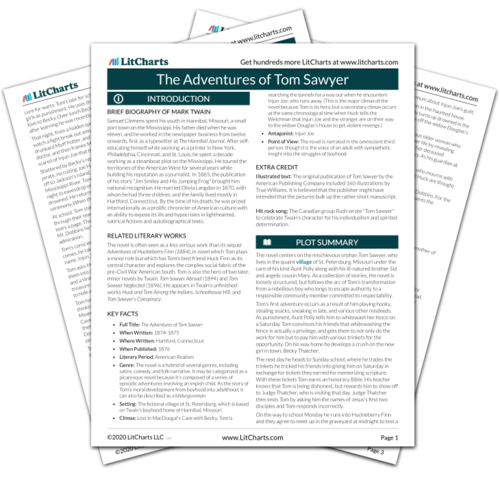 Get the entire The Adventures of Tom Sawyer LitChart as a printable PDF. Becky eventually returns to the schoolyard and sits down to read with Alfred Temple. Tom is overcome by jealousy and leaves Amy to head home. With Tom gone, Becky finds Alfred dull and tells him to go away. Becky turns Tom's latest trick—hanging out with Amy—back against him by paying attention to Alfred. Both Tom and Becky behave like brats in playing with the feelings of Amy and Alfred just to torment one another. Furious at how he's been treated, Albert seeks revenge against Tom. Alone in the schoolhouse, he spills ink inside of Tom's spelling book. Alfred's act is more mean-spirited than any that Tom has committed. Becky sees Alfred's wrongdoing through the window. She decides to win Tom back by telling him what Alfred has done, then changes her mind and decides to let Tom get whipped because he ignored her. Becky behaves as badly towards Tom as she believes he would towards her. Becky was much more attractive when she was falling for Tom's romantic tales. O'Dwyer, Deirdre. "The Adventures of Tom Sawyer Chapter 18." LitCharts. LitCharts LLC, 22 Jul 2013. Web. 4 Nov 2018. O'Dwyer, Deirdre. "The Adventures of Tom Sawyer Chapter 18." LitCharts LLC, July 22, 2013. Retrieved November 4, 2018. https://www.litcharts.com/lit/the-adventures-of-tom-sawyer/chapter-18.